We’ve already experienced it, and it’s the same thing every year. Winters in Northeast Ohio are brutal! The cold, snow, and ice wreak havoc on everything and a single blizzard or power outage can cause a lot of damage to your home and property. So, if you want to avoid the high costs associated with repairs, make sure you focus on winter home maintenance now. It’s never too late to get your home ready for the winter season. 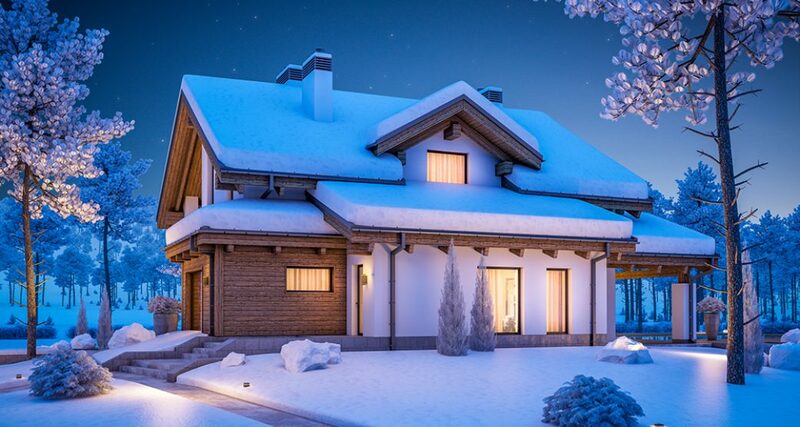 Here are four winter home maintenance tips to help you get started. Have your heating system professionally checked. Annual inspections of your heating and insulation systems, including furnace, boiler, and chimney, can ensure proper functionality all winter long. Find someone experienced with good references. If you find old parts, replace them. During the inspection, if you find out that any of the parts of the system need replacement, don’t wait or try to save a buck. Get new parts as soon as possible to enhance the longevity of the system. According to the U.S. Department of Energy, replacing worn out parts could reduce your yearly energy bills by 20-40%. And the cost you spend now on parts will be far less than if the system completely breaks down. Balance the temperature inside your house. To prevent water pipes from freezing, make sure you set the temperature of your heating system to at least 55 degrees. The temperature inside the walls that contain the water pipes is colder than the temperature inside your house. Also, if there are any unoccupied rooms in your house, make sure you keep them open to balance the temperature while the heating and insulation system is doing its job. Add weather stripping around doors and caulk windows to guard against drafts and heat loss. Properly insulate the attic. Another important aspect your heating and insulation maintenance is adequate insulation of the attic. If you want your heating and insulation systems to function properly, make sure you lighten the load on them by properly insulating your attic to prevent warm air from escaping. Prevent ice dams in your attic by closing any bypasses and regularly measuring the attic insulation level. Install storm windows. If your house has windows with screens that slide up, it’s a good idea to replace those screen with sturdy storm windows. They’ll protect against whatever Old Man Winter throws at you and help improve your insulation. Check your pipes. If you want to avoid expensive plumbing costs during winters, inspect your pipes, check for leaks, and fix them immediately. Damaged water pipes are at an increased risk of freezing. Protect the pipes. Cover water piping in UL-Listed heat tape and shield if it is unprotected in unheated areas such as garages, attics, or crawl spaces. Use only thermostatically-controlled heat tape if your water piping is made of plastic and follow the manufacturer’s installation directions. Caulk and weather-strip areas that can leak in cold air and affect your pipes. Even if the pipes are already insulated, some extra insulation won’t hurt. Know how to turn off the pipes. If you want to efficiently tackle water pipe freezing issues, learn how to shut off them off! If there are interior shut off valves that lead to an outdoor faucet, as soon as you spot a frozen pipe, close the valve, and drain the water in the pipe. Any remaining water inside the pipe can freeze and damage the line. You can also shut off the main water supply inside your house. Consult a plumber if you need assistance. Prevent water damage using your home security system. These days, home security systems are loaded with useful features that can help you prevent water damage. The technology in a professionally-installed home security system can send you real-time alerts when the temperature inside your house drops to a certain temperature. If there’s a severe leak in your basement, the system’s water sensor will send you a notification. If you’re outside, you can use the home security system’s Z-Wave devices to unlock the front door and allow a friend or neighbor to shut off the water system for you. Trimming trees. While the trees around your property often enhance the look and feel of your property, they can become a nuisance during winters. Trim trees and get rid of dead branches, so they do not harm your home or hurt someone if they drop because of ice, snow, or wind. Cleaning gutters. Make sure your gutters are clear by removing sticks, dirt, and debris to allow the melted snow and ice to drain easily. Properly positioning downspouts. Make sure your downspouts are directing melted snow and ice away from the foundation of the house. Inspecting smoke and carbon monoxide detectors. Test your smoke and carbon monoxide detectors and change their batteries as needed. A good rule of thumb is to change batteries when you change the clocks for daylight saving time. Repairing handrails and steps. If the handrails or steps on your house are damaged, get them repaired before the snow starts falling. Damaged steps can lead to injuries and leave you liable. While not all stairs require handrails (check your local regulations), it’s always a safer option to install them. This is critical if you have elderly people coming in and out of the house. A winter survival kit. To comfortably survive at home during the winter season, put together a survival kit that includes blankets, snacks, flashlights, batteries, space heaters, first-aid kits, boots, gloves, and anything else that will get you through a cold and dark night. Have an emergency evacuation plan in place as well. Roof rakes and snow shovels. You’ll need a good snow shovel (or two) to clear driveways and walkways during snow falls. If it’s feasible, consider a snow blower as well (your back will thank you). You should also get a roof rake to remove excess snow from your house. Roof raking can prevent the formation of ice dams, which can cause major damage. Ice melting compounds and salt. If you’re unable to break through the ice at your door or in the driveway, you can use salt and/or ice melting compounds such as potassium chloride and magnesium chloride to remove ice and snow. Consider “safe” salts if you have children or pets in your home. At ProTech Security, we have a strong history of experience, innovation, and customer service. The ProTech Security Advantage is more than 30 years of service in Northeast Ohio and a strong commitment to providing quality, cost-effective protection for homes, businesses, educational institutions, and government facilities. To see what ProTech Security can do for you, contact us today.